Broken Spring On Your Hands? Contact Our Experts For A Replacement! If you’re looking for more information about garage door springs and how we can help you with it – you’re in the right page! Read on and let us know if there’s anything we can do to help! What's the difference between the two, and how do you know which you have? A simple trick is to look up and see where the springs are located. If they're in the center, they're most likely torsion, and if they're on the sides they're probably extension. While both types work in the same basic way to create tension which translates into energy, they do so differently. Extension springs are pulled out to store the necessary energy that gets your door moving, while torsion springs achieve this by twisting. How does this matter? While they work well enough, torsion springs are preferred by most professionals due to being sturdier and safer. The constant stretching out of extension springs makes them weaken faster, and they tend to snap when they break and go bouncing around the garage, which is dangerous if anyone happens to be inside. Sometimes all that's needed for your springs is some maintenance to get them back in working order, such as adjusting them so they're properly situated to do their job. Lubrication can help things move more smoothly, particularly if your door has to deal with drastic temperatures such as ice which can make springs more brittle and liable to break. Our trained technicians can be out in no time to take care of replacing a broken spring of either kind, as well as check the remaining ones to ensure that they aren't too worn and in need of being switched out as well! Due to your springs doing the heavy lifting in getting your door up and down, trying to work on them yourself is highly ill-advised, as it could be extremely dangerous to do so. We'll be able to get them taken care of before you know it, and far more safely as well! Your door will be working like a charm again in no time. 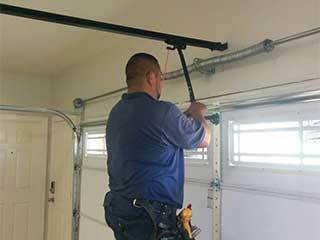 Contact Garage Door Repair Vista today to learn more about what we can do for you!